My mom recently took a trip she’d been wanting to take for a long time. India’s Golden triangle is a well-known tourist circuit, but for her to hop on a plane across the world on her own, is quite admirable. 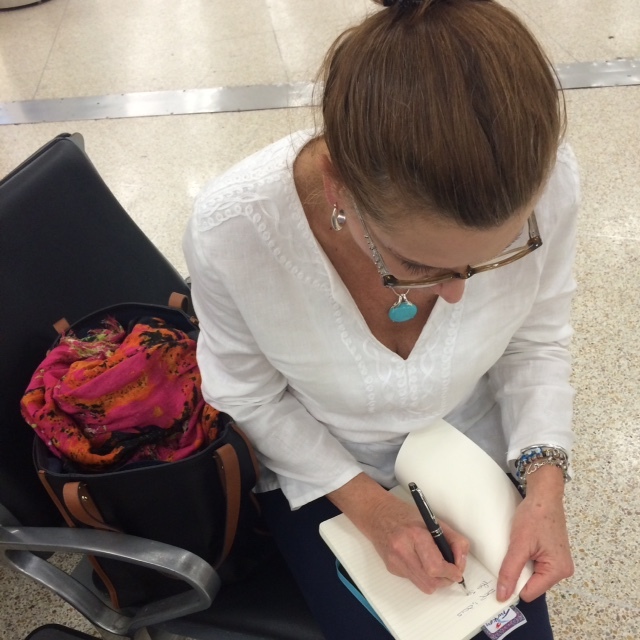 I asked her to lend me her journal so I can share her experiences with you. Here is part 1 of her itinerary: Delhi. After a two hour delayed flight, I finally arrived to New Delhi International Airport. What I encountered was a very modern and efficient airport. Wifi was conveniently available and minutes after landing I was picking up my luggage. i was greeted by Anoj with a traditional garland of Marigold flowers. The fourteen petalled golden flower is known as the “herb of the sun” and represents passion and creativity, I am told Marigold flowers are also used in the temples to honor the gods. We met the driver and I was headed to the hotel. It was almost midnight and to my amazement, there were people everywhere. The roads were packed with cars and trucks and i thought to myself this must really be the city that doesn’t sleep as Anoj tells me traffic is like that all the time. What surprised me the most was that they were able to make two lane road into six lanes seemingly without getting into accidents. Maybe its because they blow the horns, at all times. At the hotel I was greeted by a very warm staff. The Visaya is a boutique hotel in a very nice area in Delhi. I’m told it’s hard to know what a nice area would be. What I saw was a colorful blend of dilapidated buildings and apartments mixed in with with more modern structures. The room is decorated in lovely warm colors like the rest of the hotel and is perfectly clean and comfortable. After a long shower and a cup of tea I’m ready for bed. The plan for tomorrow is to meet my guide at 9:30 AM for a city tour of Delhi. Didn’t sleep well even after my trusty melatonin, nonetheless I was eager to start my day. I got ready and went down to breakfast. As soon as I stepped off the elevator, I was greeted by the fragrant aromas of curry and other spices unknown to me. Breakfast was black lentils also known as Dal Tadka with a creamy sauce and rice. It was delicious, no to spicy and warming. I never thought you could eat something like this for breakfast. At 9:30 sharp I met Sugute, my guide for the day. He was dressed in a beautiful red kurta shirt. 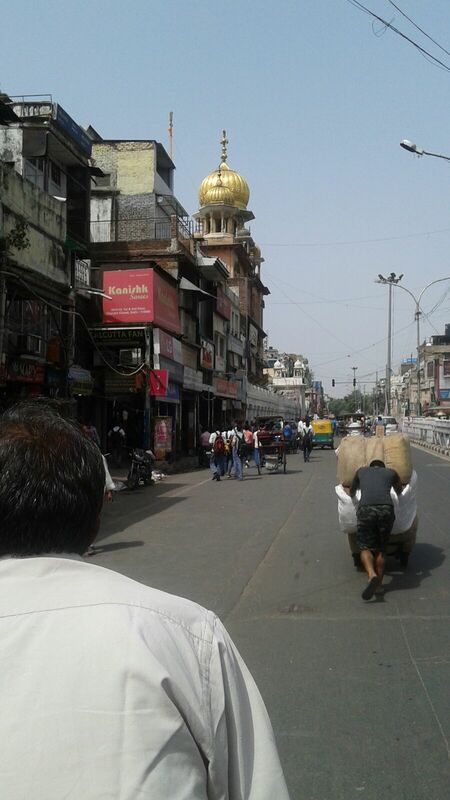 The first stop on our tour was Old Delhi. Narrow streets with shops side by side. People everywhere, cooking, eating, talking, walking busily. It seemed to me that people in Delhi always have the need to be busy. Old Delhi is the place to go to buy everything from spices bulk to a wedding dress. I was told to expect large piles of garbage and bad odors by my tour guides, but was actually impressed that as packed as this part of town was and the amount of activity that was going on, it really wasn’t at all. I purchased all my spices here as well as a tea called Emperor’s Tea, which is supposed to be very good. It better be! It was expensive, even for india. I read in a magazine that the way this tea is made is what makes it so expensive. The spices I purchased include cardamon, saffron, curry. I also bought a tea made with mango. i just couldn’t resist the its scent of it when the sales person offered it to me! I’m looking forward to savoring it at home and to trying out a new recipe with my fresh spices. The ride back to the hotel was out of this world. I saw guys on bicycles pulling a cart with people sharing the packed road with motorcycles and cars. Jama Masjid, India’s largest mosque. 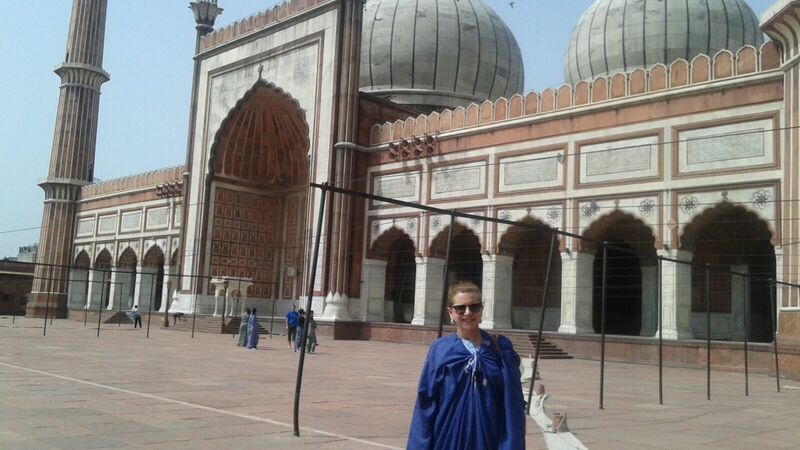 The Jama Masjid is India’s largest mosque. It was built by Mughal emperor Shah Jahan (who also built the Taj Mahal) between 1644 and 1656. I was amazed by the size of the large pool located in the center and used for people to clean their feet before prayer. Many monuments in India have the Mughal signature. Their architecture is rich in details and displays their spectacular talent for stone carving. Many Indians visit these monuments on a regular basis. At one of the monuments, I encountered a number of little girls on a field trip. They were adorable. Happy and well groomed they all wanted to take pictures with me and their cell phones were even more modern than mine! I found it very encouraging that the Indian government is encouraging girls more and more to stay in school and pursue their education. In such a tradition-governed culture its an effort that’s working. As I leave Delhi what I am most surprised and delighted to see was how many religious customs have evolved to adapt to a new way of life without loosing their traditional values. The new generation is carving a way for themselves while still embracing the richness of their ancient culture and respecting the ways of their ancestors. The next stop on the itinerary is Jaipur a six hour drive away. After an wonderful day of sightseeing, I’m ready for bed.